What are the best headphones for kids? You are here: Home / Travelling with Kids / What are the best headphones for kids? 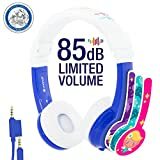 If you are planning a long trip, or just annoyed with listening to whatever game or youtube clip your child has on, maybe now is the time to get some kids headphones. 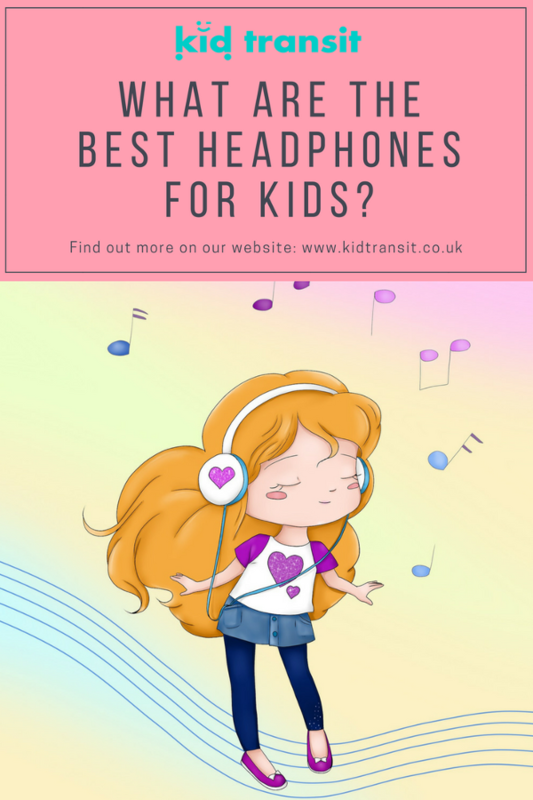 To find out what the best headphones are for children, we have done a bit of online research into the safest sound levels and the best quality you can get for different budgets. As with adult headphones, you can pay a lot of money for noise cancelling, wireless or Bluetooth options. However, bear in mind if you get a very ‘kid’ design, the headphones might not be worn for ages. If your child is older, try to go for a design that may take them all the way through to adulthood (especially if you’re spending loads). 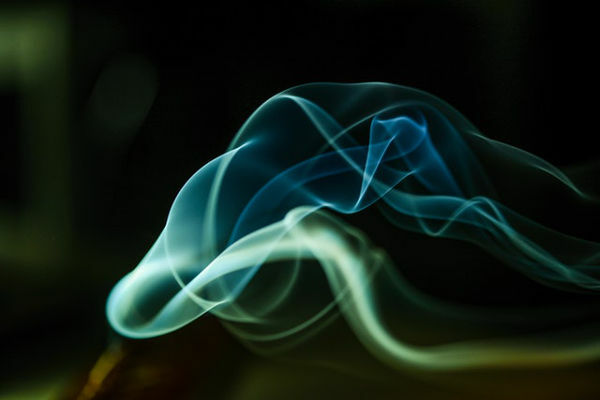 What is a safe noise level for children? Time for a scary fact: 60% of childhood hearing loss is due to preventable causes (source: WHO). Children’s ears are more sensitive to hearing loss than adults due to still being formed and a shorter ear canal meaning the delicate eardrum is nearer to the outer ear. Make sure you don’t overload your child’s ear with noise and stick to headphones that have a limiter set at 85 dB. This is the recommended LOUDEST level for children to be exposed to so stick to that or indeed lower. Good headphones will be noise cancelling so lower volumes will be easier to hear when you are in a louder environment such as a plane. The WHO also recommend to only use headphones for an hour a day, even at low volumes. 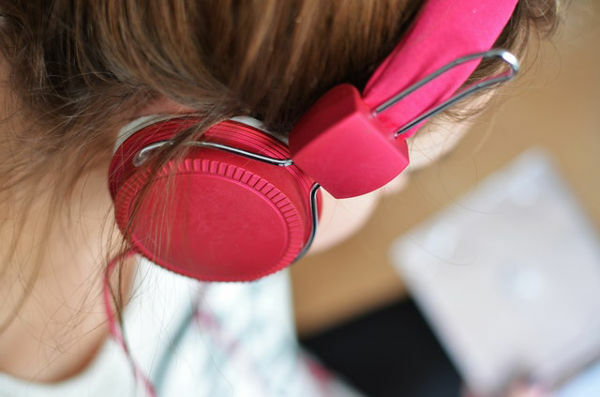 Now, this may seem very limiting on a long journey, however, regular breaks to do other activities that don’t use headphones can easily be incorporated so that your child is not using headphones for really long periods of time. Don’t buy young children in-ear headphones as it puts the sound too close to the delicate eardrum. All the headphones we suggest below are over-ear ones. Also, with very young children, always supervise if they are using headphones with wires as they could get wrapped around their neck. Take a look at the WHOs informative poster to Make Listening Safe. After the serious health warnings given above- all these headphones are limited to 85 dB and are headphones, not in-ear phones. One pair is also Bluetooth so can be used wireless. 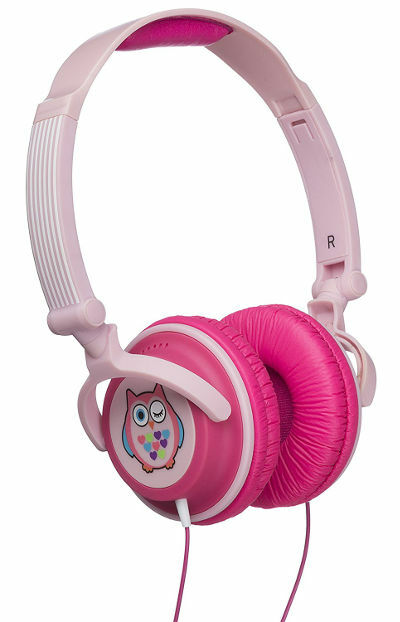 These headphones are perfect for younger kids as they have bright, colourful animal designs making them fun to wear and use. I love these penguin ones (great for Pingu fans!) but they also come in other designs like monkeys. The headphones are a low price and come with the noise limited to 85 dB. The cushioning on the ear cups makes them comfortable to wear and they can be adjusted so should grow with your child. A fun design detail is a little companion where the jack goes into the socket- on the penguin headphones this is a fish. One thing to note with these headphones is that they may not be suitable when background noise is loud. As they don’t have noise cancelling technology, they work best in quiet environments. If you want some headphones that will be the best at cancelling outside noise but still limit to 85 dB then try the Puro Sound Labs headphones. These are pricier (as you would expect with better features) than the other headphones reccommended. If you are only buying them for use on planes and car journeys then it might be worth making the extra investment so your child can listen easily without being disturbed by background noise. The headphones are Bluetooth enabled and have up to 18 hours battery charge so should last for very long journeys (especially if you remember to turn them off when not in use!) The design is more stylish than childish so would suit older kids as well. You can always add stickers if younger kids aren’t liking them as much. 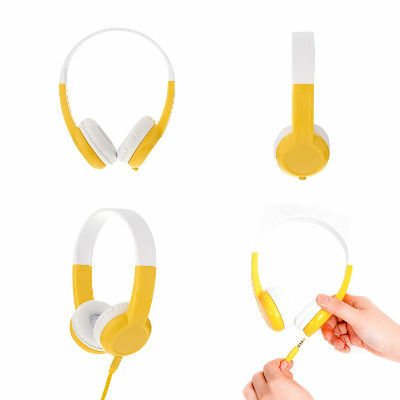 The Puro headphones are made from lightweight materials and have comfortable ear pads as well as a padded adjustable headband so shouldn’t feel too heavy on your child’s head. 85 dB volume governor to protect eardrums of young kids; integrated volume control from left ear cup. 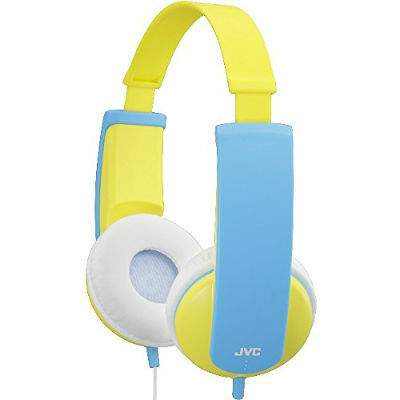 These headphones from JVC are in lovely bright colours and come with stickers to decorate them with. Looking at the comments on Amazon, the stickers are a big hit with children, even if the parents think they are a bit rubbish! The plastic look is maybe not for everyone, but they are noise limited and the wide headband should mean they stay comfortable on your child’s head. 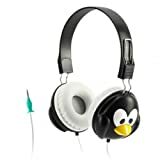 These headphones are back in the animal theme (like the Griffin KaZoo ones) with lots of characters to choose from such as aliens, ladybirds, owls and of course penguins! They are cheap and cheerful but still have some padding on the headband and large padded ears to feel comfortable. As with all of the headphones here, they are volume limited to 85 dB. The headphones can fold so are easy to store and carry around when travelling. The fun designs should really suit younger kids and the adjustable headband means they can grow with your child. These headphones are a great choice for little kids, suitable up to about 5 years of age. With the bright colours teamed to a smaller headband and ear pads the Buddyphones are perfect for little ones. They are volume limited to the crucial 85 dB and also designed for the destructive nature of younger kids so should stand up to a bit of a battering. The Buddyphones come in a number of different colour options and designs. The cable is a flat one so less chance of tangles in a bag. There is also a built-in audio splitter on the cable so two kids can watch the same screen. Once you know what the safe level of noise children should be exposed to, you can start to decide on the best headphones for your kid. Those that limit noise to that 85 dB level are the best place to start. If your kid likes bright, fun designs then there are a lot of low price options out there that will do the job. However, if you want something that’s a bit more special with good sound quality, noise cancelling, and Bluetooth then the Puro Sound Labs Headphones are a brilliant option. Let us know your experience with headphones for kids over at our Facebook group.